Looking for perfect, moist, butterly delicious cake that tastes divine? Here goes the best homemade banana bread recipe. This sweet treat topped with almonds makes a best tea time healthy snack for kids & adults. Sweet ripe bananas is the key ingredient of this recipe. You can also top with cream cheese icing and enjoy the best moistest cake. Go on, try this easy video recipe..! In a mixing bowl, add banana pieces and mash it to paste. Add powdered sugar, vanilla essence and mix completely. In the second bowl, add maida flour, baking soda, baking pwd, salt, cinnamon pwd, nutmeg pwd and mix. Add this flour mixture to the wet ingredients. Add walnuts, yoghurt and milk. Blend together with blender to smooth consistency. Place butter paper on cake tin. Grease it with butter and dust with all purpose flour. Add the cake batter to the tin. Sprinkle chopped walnuts on the cake. Bake cake at 180 degree celsius for 30 to 35 mins or until the cake is done. Insert a tooth pick at the middle of the cake and check if it comes out clean. If its sticky, then bake for few more mins. Allow the cake to cool in a wire rack for 15 mins. 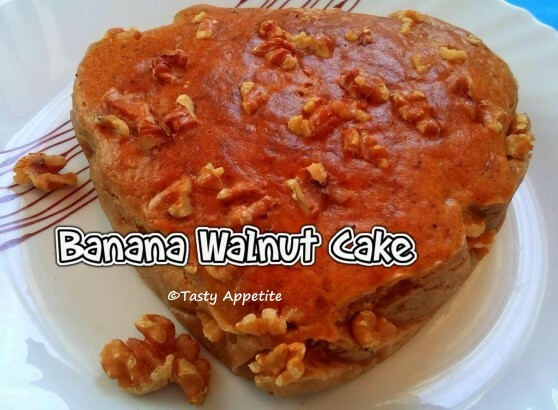 Yummililcious soft & moist banana walnut cake is ready.